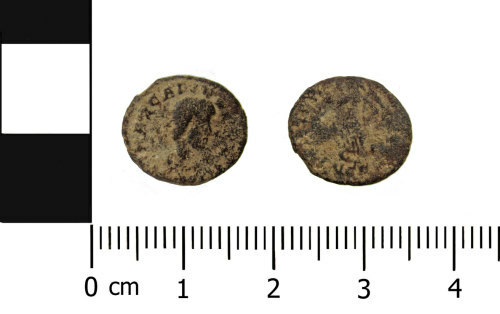 A complete but worn copper alloy Roman nummus (AE4) of Arcadius (AD 388-402), dating to AD 388-392 (Reece Period 21). VICTORIA AVGGG reverse type. Mint of Lyon. Copper alloy nummus of Arcadius (AD 388-402), dating to AD 388-392 (Reece Period 21). Reverse: VICTORIA AVGGG. Mint of Lyon. LRBC, p. 53, no. 392. A worn copper alloy Roman nummus (AE3) of Arcadius, dating to the period AD 388-402. Reece Period 21. VICTORIA AVGGG reverse type.